Voni-M D.O.O. Brus fulfills all the requirements of the enviromental management system in accordance with the requirements of the ISO 14001: 2004 standard. Environmental Protection Policy has identified the directions of environmental protection activities. Environmental Protection Policy is a statement of our commitment to apply and improve the enviromental protection performance and our dedication to its preservation and continious improvement. Environmental issues are taken seriously and considered in all activities of Voni-M doo Brus. Environmental protection is a part of our business policy and the key value of our organization. We ensure that this approach is widespread throughout the organisation and we strive to ensure that the elements of enviromental protection are fully integrated into all our business processes. We continuously improve environmental protection performances through modern system of management system and the establishment of general and specific goals. - That all our business processes are guided with sustainability principles and long-term care for the environment. - That all our business processes are implemented in a way that ensures minimal use of natural resources and pollution protection. - We fulfill the legal requirements and we strive to overcome them, where possible, through a proactive approach and following international global demands. - Through the monitoring and measurement of our performance, the implementation of documented general and specific goals, as well as regular systems and process check, we are able to demonstrate that we continually improve our performances in the field of environmental protection. - We have competent and responsible employees to sustain the performance of environmental protection we are committed to. - The top management offers full support to the implementation of the Environmental Policy. - Promoting measures to meet the requirements of the environment management system is a task for all employees. 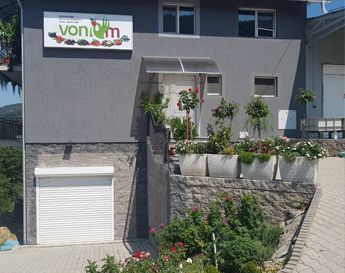 - We conduct permanent training and education in order to improve knowledge and competence of our employees in terms of linking their activities and environment protection, and therefore the business Voni-M D.O.O. Brus. Openly and honestly we communicate about Policy with the employees and all interested parties. Environmental Protection Policy that applies on all our location, it is highlighted at the entrances and visible places in Voni-M and is binding on all employees. - We strive for continual improvement in overall environmental performance. Voni - M D.O.O. Bruce meets all requirements of the health and safety management system in accordance with the requirements of OHSAS 18001: 2007. Health and Security Policy at work is our statement of dedication and commitment to protection and continuous improvement of health and safety at work. Politikom zdravlja i bezbednosti na radu utvrdili smo pravce aktivnosti vezane za uspostavljanje sistema menadžmenta zdravljem i bezbednošću na radu. Voni - M d.o.o. Brus je privržen ostvarivanju politike zdravlja i bezbednosti na radu. The Health and Safety Policy at Work identified the activities related to the establishment of a health and safety management system at work. Voni - M D.O.O. Brus is committed to achieving health and safety at work. Protection and improvement of health and safety at work are part of our business policy and represent the key values of our organization. We continuously improve the performance of health and safety at work through a modern management system and goal setting. - through the monitoring and measurement of our performance, the implementation of documented goals and regular system and process checks, we are able to demonstrate that we continuously and in the long run improve the performance of health and safety at work. Our employees are competent and responsible for the implementation of the process in a safe manner in accordance with legal requirements and prescribed procedures. They are trained and in charge of carrying out the process in a safe manner in accordance with the prescribed procedures that lead to the prevention and elimination of occupational diseases and injuries at work. Employees must use personal protective equipment, apply control measures and report it. Movement paths in workplaces must be safe for any person. Promoting measures to meet the requirements of the health and safety management system is a task of the management at all levels. The top management is fully supportive to achieving health and safety at work. The policy is regularly reviewed, and where needed, revised. We provide permanent education and training in order to improve the knowledge and competence of our employees. Openly and sincerely communicate about policy with employees and all stakeholders. The health and safety policy at work, valid on all our locations, is highlighted at all entrances and in the visible places of Voni - M D.O.O. Brus. The Health and Safety policy is binding on all employees. Voni - M D.O.O. Brus has defined the general and specific goals of environmental protection in the function of fulfilling the Environmental Protection Policy and the improvement of the impact on the environment. Overall goal: to improve readiness for responding to emergencies that may have a negative impact on the environment and to provide preventive action through the regular implementation of control over operations. Specific objective: to implement proactively and easily search for legal and other requirements in the field of environmental protection and to ensure timely analysis and initiation of compliance measures with them. Ensure strict compliance with all safety and health measures at work by employees and other stakeholders related to the business processes of Voni-M d.o.o. Brus; record and react in a timely manner in case of failure to comply with the prescribed protection measures. Improve compliance for legal and other requirements in the field of occupational safety and health, identification, timely distribution and analysis of relevant requirements, and proactive initiation of measures in order to harmonize with the same. To ensure and enhance competence, awareness and responsibility in the field of safety and health at the workplace of employees and other stakeholders, in day-to-day work, through permanent internal and external education, training and verification of competence as well as motivation of employees for an active participation in developing the system for management of health and safety at work.